If given the choice between a book and a toy, what would your child pick? Most days NHL would select a book. A puzzle may be the only item that would tempt him away from a book. During Rosh Hashana NHL packed a bag of books to take with us to services so he could keep quiet and busy. One of the books is his new favorite about all 50 states. He quickly learned which one was our state and where other people in our life live. About two weeks ago NHL went to a birthday party for a new classmate. 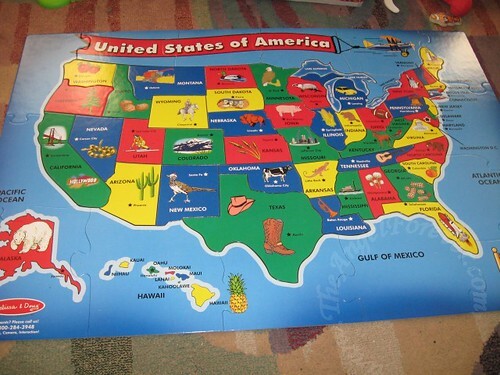 We were shocked when each child was given a Melissa & Doug 51 piece large floor puzzle of the United States. I kid you not, each of the kids (his entire class was invited) received one of these amazing puzzles. A few days after the party NHL asked if he could open the puzzle and put the states together. 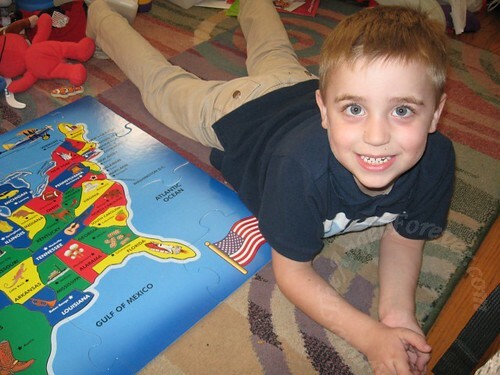 He quickly put the edges rogether and then proceded to put the entire United States together. It was fascinating listening to NHL. He recognized several of the states from their shapes. He knew many of them thanks to the book that he has from Nana and Papa. The kindergarten kid also recalled some of the facts from the book. It is truly amazing what a sponge my big guy can be. Here he is showing off his puzzle. Of course I had some fun too. Check out my caption by hovering over the photo below. I did it in a certain someone’s honor . . . you betcha! My kids always loved puzzles. 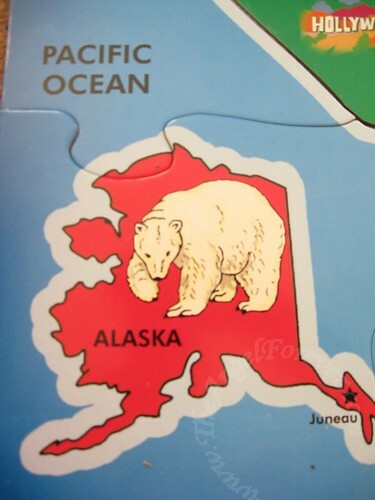 Esp the states puzzles. Learning toys are great, esp in those formative years! Loved your ‘hover message’ on the alaaaaska photo! LOL! how funny! I saw something the other day on CNN and they visited a little shanty town on the coast of Alaska which is the only inhabited area of Alaska where you can ACTUALLY SEE Russia…and the people there said, not only has Silly Sarah NOT been there, ever, but no other Alaskan gov. has ever been either. That looks like a great puzzle! WOW that’s quite a party favor! He sounds so much like Kameron! He loves puzzles too and loves history and geography facts. Wow, what a smart little cookie! And what a great take-home gift rather than a goody bag filled with junk. It is absolutely amazing how they learn so quickly and so well. One of the best gifts is being present during those times! I love party favors that don’t involve candy – like they need more of that!